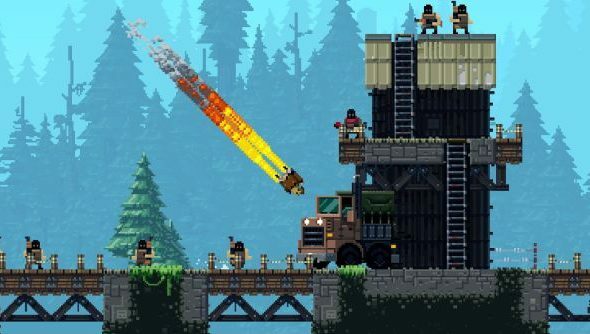 Winner of the Ben Barrett Award for Game Most Committed To The Joke 2014, Broforce, is finally making the charge out of the Soviet-filled wastes of Early Access and into the loving, freedom-having Eagle-arms of full release on October 15th. To celebrate there’s an almost indescribably great ‘trailer’ that fails to explain anything but does leave a catchy tune in your head, and the game will be receiving a major update. In for a bit of independent fun? Here’s our picks for the best indie games ever. We should have stopped Devolver Digital before it was too late. This is their world of pelvic thrusts now. That short interlude aside, Broforce’s release update will add a final set of campaign missions that involve delving into Hell itself to kill Satan. I mean, obviously, how were you expecting this to end? There’s no details on how the fight will go down, but expect the usual mix of explosions, explosions, explosions and explosions with a slightly redder texture than usual. Developers Free Lives will also be releasing a five-track EP to celebrate, which is free to everyone who owns the game on Early Access and anyone who grabs it before October 15th. After that it will, quote, “be prohibitively expensive but that’s capitalism for you.” Thank goodness for those brave boys in green or how would we pay for things. The main Broforce theme and the above Ballad of Rambro will be included. Free Lives are also releasing a series of videos on YouTube detailing the final days of development before their baby is free to run amok. This is easily on my list of Early Access games I plan to pick up once they’re out and about, as Fraser’s old Broforce Early Access reviewwas filled with praise.